896 pages | 265 B/W Illus. Thin layer chromatography (TLC) is increasingly used in the fields of plant chemistry, biochemistry, and molecular biology. Advantages such as speed, versatility, and low cost make it one of the leading techniques used for locating and analyzing bioactive components in plants. Thin Layer Chromatography in Phytochemistry is the first source devoted to supplying state-of-the-art information on TLC as it applies to the separation, identification, quantification, and isolation of medicinal plant components. Renowned scientists working with laboratories around the world demonstrate the applicability of TLC to a remarkable diversity of fields including plant genetics, drug discovery, nutraceuticals, and toxicology. Part I provides a practical review of techniques, relevant materials, and the particular demands for using TLC in phytochemical applications. The text explains how to determine the biological activity of metabolites and assess the effectiveness of herbal medicines and nutritional supplements. Part II concentrates on TLC methods used to analyze specific plant-based metabolite classes such as carbohydrates, proteins, alkaloids, flavonoids, terpenes, etc. 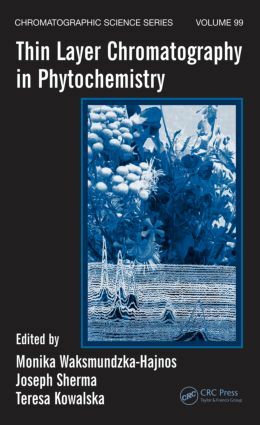 Organized by compound type, each chapter discusses key topics such as sample preparation, plate development, zone detection, densitometry, and biodetection. From identification to commercial scale production and quality control, Thin Layer Chromatography in Phytochemistry is an essential bench-top companion and reference on using TLC for the study of plant-based bioactive compounds.